Innovation leaders influence innovations and inspire innovators – sometimes for many generations to come. What are the different types of innovation leaders? 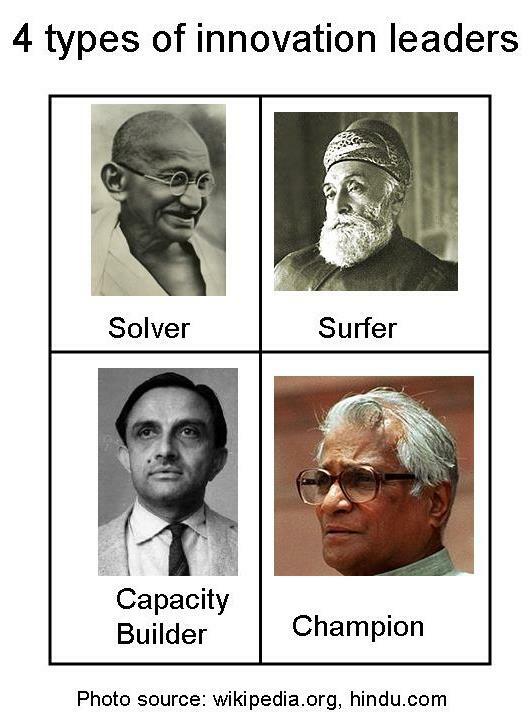 Let’s look at one such classification: Solvers, surfers, capacity builders and champions. 1. Solver: When Gandhi returned from Africa to India there were many problems he felt drawn to – Lack of vocational education, poverty, discrimination against women, caste system, political struggle. Eventually he focused on only one of them – political freedom. And he attacked the problem in a way that is still inspiring many generations more than half a century after he is gone. Solvers like Gandhi immerse themselves in a difficult problem and are always several steps ahead of their contemporaries in their approach. Other solvers that come to mind are: Muhammad Yunus (Grameen Bank), Baba Amte (Anandwan), James Watt (Steam engine), Thomas Edison (Light bulb), Andrew Wiles (Fermat’s Last Theorem), Steve Wozniak (Apple). 2. Surfer: When ring spindle, a new technology, was brought to the notice of Jamsetji Tata he immediately bought two frames and started experimenting at Empress Mill. Neither any mill in India nor the main supplier from England (Pratt) had thought of adopting the new technology. When Jamsetji encountered a report suggesting possible iron ore deposits in Chamba district, he immediately took a sample to Germany for testing. Surfers are always looking for waves, especially BIG waves. Many times they don’t know where the wave is going to lead them to. Some of my famous surfers include: Bill Gates, Steve Jobs, David Grossman (IBM), Jeff Bezos (Amazon), Mark Zuckerberg (Facebook), Masaru Ibuka (Sony). 3. Capacity builder: When Padmanabh Joshi wrote his PhD thesis – “Vikram Sarabhai: A study on innovative leadership and institution building” from Gujarat University in 1986, the term “innovation” itself wasn’t fashionable let alone “innovation leadership”. And yet he couldn’t have chosen a more apt title for the thesis. Vikram Sarabhai was instrumental in building innovation capacity in India through institutions such as – ATIRA: India’s first textile research cooperative, Physical Research Laboratory (PRL), ORG: India’s first market research organization, IIM Ahmedabad. As if this wasn’t enough, Sarabhai architected India’s space program. The secret, according to him, was in establishing a firm foundation: “The early beginnings of any institution are crucial, and the “culture” (or lack of it) brought the first entrants plays a significant role in establishing norms, procedures and practices” he said. Capacity builders work on various elements of the innovation ecosystem. Another of my favorite innovation capacity builders is: A G Lafley (P&G). 4. Champion: George Fernandes took over as railway minister in December 1989. Next month in January, he called for a board meeting at Raj Bhavan, Lucknow. In his talk he mentioned that there were two projects which were uppermost in his mind and they were his dreams for a long time. One was a railway link between Chithoni and Bogha in Bihar crossing the mighty Gankat river and the other was the west coast railway connecting Bombay and Mangalore (later called Konkan railway). Dr. E. Sreedharan attended the meeting as an engineering member from railways. Fernandez told Sreedharan in the meeting, “I will depend on you for realizing these two projects”. Fernandes neither had the technical know-how nor had the resources. But he used his influence with Chief Ministers like Mulayam Singh and Lalu Prasad Yadav and senior ministers like Ramakrishna Hegde and Madhu Dandavate and removed the hurdles for each of the projects. Champions support others’ ideas and help them move forward faster. 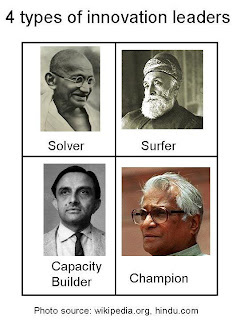 Other champions I can remember are: the role Einstein played for Satyendra Nath Bose or the role Patrick played for Grossman at IBM.